The story of Al Clark started many years ago. I had the idea and started the novel where it sat on my computer for three years. 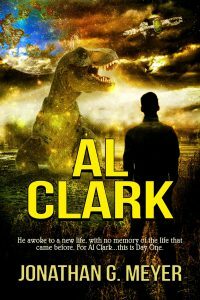 When I retired and found myself at a loss for something to do, I created the first book in the Al Clark series. The characters in Al Clark are a conglomerate of people I know. They are complicated individuals striving to excel during extremely difficult times. Even the characters that are not human have distinct personalities. Standing at the top of a grass covered hill, with a sweet smelling breeze at his back, he reveled in the bright morning sunshine of a perfect spring day. Jagged heights filled the horizon as the sun hoisted itself up and kissed the mountain tops. In the valley below, a small idyllic village was shaking off the night and was well into the process of beginning a new day. The faraway villagers appeared to be enjoying the day as much as he. Someone was running up the hill towards him, yelling something—a couple of words, over and over, perhaps a name, maybe a warning? He cupped his ears with his hands to better hear what the person was saying, but the sounds came muffled and distorted; carried away by the wind. The person got closer and closer, arms and legs pumping, and the words began to get clearer and clearer until just on the verge of understanding, the sky turned a blinding white, and then quickly—faded to black.